Nashbar is bringing the savings with it’s latest hardtail entry the Nashbar 27.5/29″ Disc Mountain Bike (what a strange name, isn’t it?). Even saving money on the name of the bike, Nashbar has figured out how to bring together quality components at bargain prices. Good luck finding another mountain bike in the 350 dollar range with disc brakes, 29’’ tires and 100mm of front travel. Am I saying this is the best mountain bike money can buy? No. Am I saying this is the best ride you can get for $350? Probably. For those of us entrenched in the 27.5” vs. 29” wheel debate, Nashbar diplomatically offers both. Surprisingly, the 29” disc mountain bike comes in 30 dollars cheaper than it’s 27.5 inch counterpart. While the components of the two bikes are similar they are not identical. The forks of the two bikes are obviously different lengths to account for the variation in wheel sizes. Beyond that, the 27.5” uses the Tektro Auriga disc brake set which weighs in roughly 20 grams heavier than the Tektro HD-M285 system used on the 29’’. This difference in braking components is what makes the 27.5” bike more expensive than the 29”. 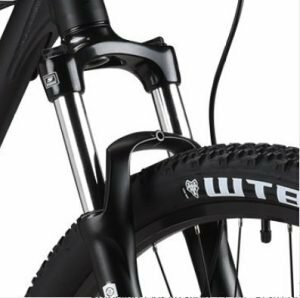 I am a fan of a 29” tire although the upgraded Tektro Auriga brake system makes choosing between the two bikes a difficult decision. If one were to buy the 29’’ and try to upgrade to an Auriga system, it would cost well above the 30 dollar difference that Nashbar offers the two bikes for. An aftermarket Auriga system is currently running about 90 dollars. Both bikes come with non-series general-purpose components including a Shimano FD-TY700 front derailer, a Shimano Acera SGS RD-M360 rear derailer, and Shimano SL-M310 shifters. Fun fact, the Shimano SL-M310 come with an optical gear display taking the guesswork out of changing gears. Being able to glance down and see what gear you are in will prevent unnecessary shifting, preserving the life of your shifting system. The Suntour crankset has three chainrings which really enables you to find a range for any type of cycling you may be doing. Climbing is a breeze with the Nashbar Disc mountain bike as the largest chainring has 45 teeth and is poised to convert effort into torque. The smallest chainring on the Suntour crankset has 22 teeth giving the bike a truly awesome high-end range. Nashbar is offering both bikes at the 15, 17, 19, and 21 inch sizes. At these sizes, riders with heights between 5 ft. and 6 ft 4 inches will be able to find a perfect fit. 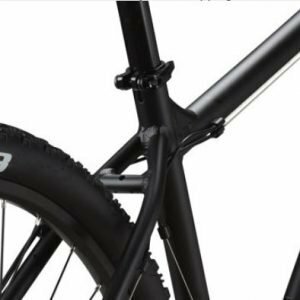 The frame geometry is also pretty similar with the exception of the chainstay length (the 29” has an extra 15mm of chainstay length) and a 1° difference in headtube angle. Out of the box, the Nashbar Disc mountain Bike will be able to compete with mountain bikes twice its price. Nashbar’s warranty is one of the best in the business. If this bike does not meet your standards, simply return it to Nashbar for a replacement or refund. The bike could possibly turn out to be a disposable bike, not standing the test of time. In such a case it is cheap enough to by another one or uses Nashbar’s Forever Guarantee. Overall, the bike as a whole seems pretty cohesive and I would be reluctant to do any major elective upgrades to it. Probably the safest investment you could make in upgrading the Nashbar Disc mountain Bike would an upgraded wheelset. Don’t get me wrong, the Weinmann Zac 19 double wall wheels are great for the price, but you could have problems with them down the road. An upgrade to the wheelset would surely increase the bikes ability to take a punishing. Further, upgrading the wheels on this bike would likely cut down significantly on the overall weight of the bike. While we are discussing the wheels, the Nashbar website lists the 27.5’’ wheelset being quick release, while the 29’’ does not have the quick release designation. Also, the 29’’ has Schrader valve drilling while the 27.5’’ does not mention the Schrader valve drilling. This inconsistency in the two bikes could possibly be an oversight on the website and both wheelsets are the same OR they are two different sets of wheels which would explain the 30 dollar difference in the price of the bikes. If the 29” does, in fact, come with a nutted system then this would be my first upgrade to make as quick release wheels are just so much more convenient. If you are thinking of purchasing the 29” I would check with Nashar on this point before purchase.